FILE - A Saudi soldier sits on top of an armor vehicle as he aims his weapons, on the border with Yemen, at a military point in Najran, Saudi Arabia, April 21, 2015. Saudi Arabia says artillery fire on the Saudi-Yemeni frontier killed seven civilians Tuesday in the Saudi city of Najran. Continuing cross-border strikes by Arab coalition forces and Iran-backed Houthi rebels in northern Yemen have killed nearly 50 people since Saturday. Saudi television said the Houthis' shells landed in a crowded industrial area of Najran, a southwestern city of more than a quarter-million people. The report described Tuesday's artillery barrage as one of the deadliest recent attacks on the kingdom. In Yemen, meanwhile, authorities blamed the Saudi-led coalition for an airstrike that killed nine family members at a residence east of the capital, Sana'a. FILE - A worker looks for survivors under the rubble of a food factory hit by Saudi-led airstrikes in Sana'a, Yemen, Aug. 9, 2016. The attacks are the latest sign of rising border tensions stoked by the Saudi-led coalition's military push against Houthi rebels in Yemen trying to topple the country's internationally recognized president, Abu Rabu Mansour Hadi. On Monday, a coalition airstrike hit a Yemen hospital near the border, killing at least 14 people, including volunteer physicians from the medical charity Doctors Without Borders. 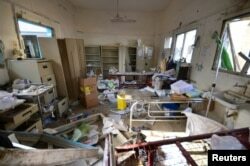 Damage is seen inside a hospital operated by Medecins Sans Frontieres after it was hit by a Saudi-led coalition airstrike in the Abs district of Hajja province, Yemen, Aug. 16, 2016. Separate Saudi strikes hit a residential area in northern Yemen on Saturday, killing at least 19 people, most of them identified by authorities as children at a school in Haydan. A Saudi coalition spokesman said the airstrikes had targeted a training facility run by Houthi rebels. The government of President Hadi and his Sunni backers have demanded that Houthis withdraw from all territory gained since hostilities erupted in September 2014, when rebels seized the capital in an uprising caused by what they said was years of government discrimination. Rights groups have accused both sides of failing to protect civilians and other abusive practices. Peace efforts led by the United Nations have failed to end the violence. Monitors say at least 6,500 people have been killed in the fighting, including more than 3,200 Yemeni civilians.